So you’re getting ready to move—or trying to. Where do you start? With all the calls, planning and organization that go into a successful relocation, it’s sometimes hard to keep it all straight. Here, your friends at O’Mara Moving break down the entire moving timeline, from the first call to unloading the last box, so you can have one less thing to worry about. Well before you plan to move, select the right Rockford residential movers, such as the professionals of O’Mara Moving, to handle all of your local, long-distance or specialized moving needs. Once you make a final decision, call the company and arrange to have a representative come out to perform a free, in-home evaluation and consultation. During the consultation, the representative will take a visual inventory of everything you plan to move and give you an estimate of moving costs. Be sure and point out anything that you want to move that might not be immediately apparent (furniture in storage, items in a basement/attic, etc.) so that you can have the most accurate quote possible. This is also the time when you can ask any questions you may have about the moving process. After you have all your questions resolved and have finalized your estimate, talk to your company representative about the exact date and time that you would like to move. Be sure and also work out any special arrangements that may need to be made, such as having to make more than one stop, etc. Once you have all the details finalized, it’s time to start getting everything organized. Besides going through all your belongings to weed out anything that you can donate, throw out or give away, you’ll also need to get all of your personal accounts organized as well. This includes notifying the post office, medical, legal and other personal services of your new address. You will also need to make sure that all utilities and services such as water, television, etc. are cancelled or transferred as appropriate. To avoid rushing and last-minute packing, be sure and start as early as possible. Packing up seasonal, seldom-used or non-essential items first is the best way to start. Make sure to label all of your boxes and containers clearly with the contents, if they’re fragile or not, and what room in your new space they should be placed in. This will help both you and the moving team keep everything organized and easy to find on the big day. While you’re packing, make sure to keep an inventory of all of the items you are planning to move to keep with you throughout your relocation. 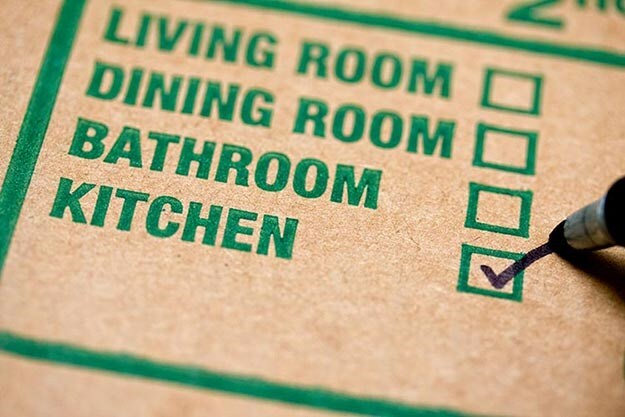 An easy way to do this is to mark all room-specific boxes with a number; ie, “Kitchen box 1 of 5”, so that you know exactly what you have—or might be missing. Keep your completed inventory list in a safe place with the rest of your necessary moving paperwork. Once your moving date is only a few days away, call your moving company and confirm that everything is on track and is set to go according to plan. If there has been a change in availability or another obstacle, it’s best to find out ahead of time and resolve the issue. On your big day, make sure that you have all the necessary paperwork ready and easily accessible, both for the movers and anything you might need for the new house. As the truck is being packed up, double check that everything is properly marked and that the moving team has a map of the new house so they can quickly and easily locate the room where each of your boxes goes. Before you leave your old house, double check to make sure that all doors and windows are locked and secure. Once you’re all moved in, make sure that all inventory is accounted for and resolve any claims you may have with the moving company. Once that’s finished, it’s time to unpack and enjoy your new home! For more information about the moving process, or to get started on your own relocation, call the Rockford household moving experts of O'Mara Moving to get started! You can also fill out our quick and easy online form for a FREE estimate of moving costs!